This is the basic point of the lesson and is summed up in a short sentence. Its the big idea you want your teens to grasp from each weeks session. Lara Blackwood Pickrell, writer of Unit 2, is an ordained minister in the Christian Church (Disciples of Christ) and serves Hillside Christian Church in Kansas City, Missouri, as associate minister for youth and young adults. She is passionate about finding ways to weave together ancient Christian stories and practices, contemporary needs, and many generations of Gods people. Writing and other creative practices are an essential part of her ministry, along with summer camps, social media, womens issues, sexuality education, and deep conversation over coffee. Check out how she and her youth ministry colleagues are taking risks for the sake of the church by visiting www.Partnership.org. Julie Conrady, writer of teacher articles, has written for Bible Lessons for Youth since 2006. She has taught all ages in churches and in schools, but especially likes working with youth. She currently serves as a Chaplain Intern at a local hospital and enjoys scrapbooking, reading, and playing videogames in her spare time. She lives in Norman, Oklahoma, with her husband Josh, dog MollyJane, and black cats Seuss and SamIAm. Lee Yates, writer of Unit 1, is an ordained minister in the Christian Church (Disciples of Christ). After fifteen years of congregational ministry, Lee now spends his time writing and consulting. He also spends his summers leading hands-on mission events and speaking at church camps. He credits his wife and children for most of his good ideas. He and his family live in New Castle, Indiana. 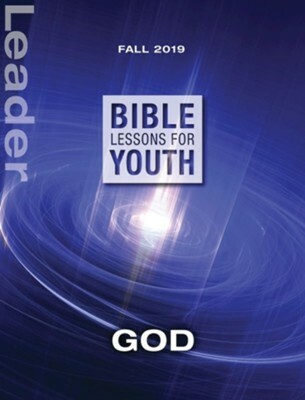 I'm the author/artist and I want to review Bible Lessons for Youth Leader Fall 2019 - eBook.